Check out some of EVO's robust features below. 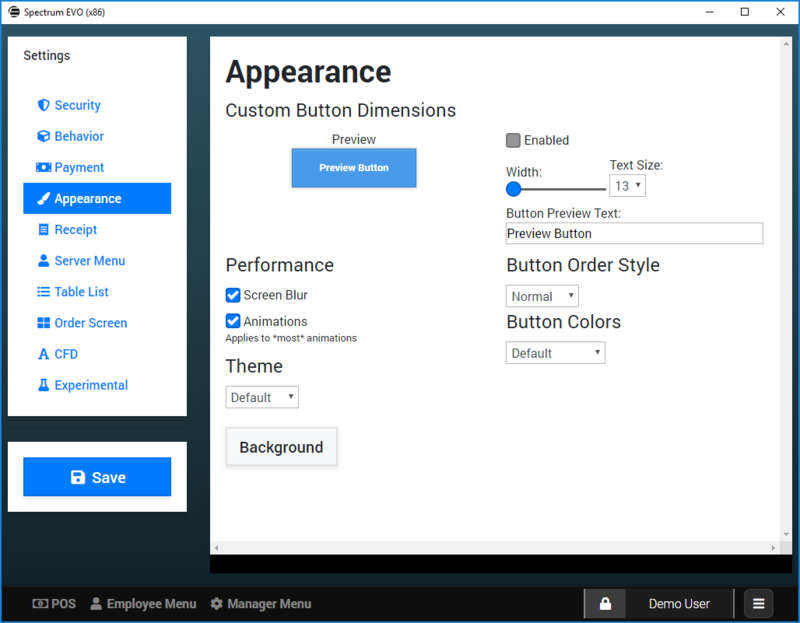 Click on any thumbnail to view the image fullscreen. 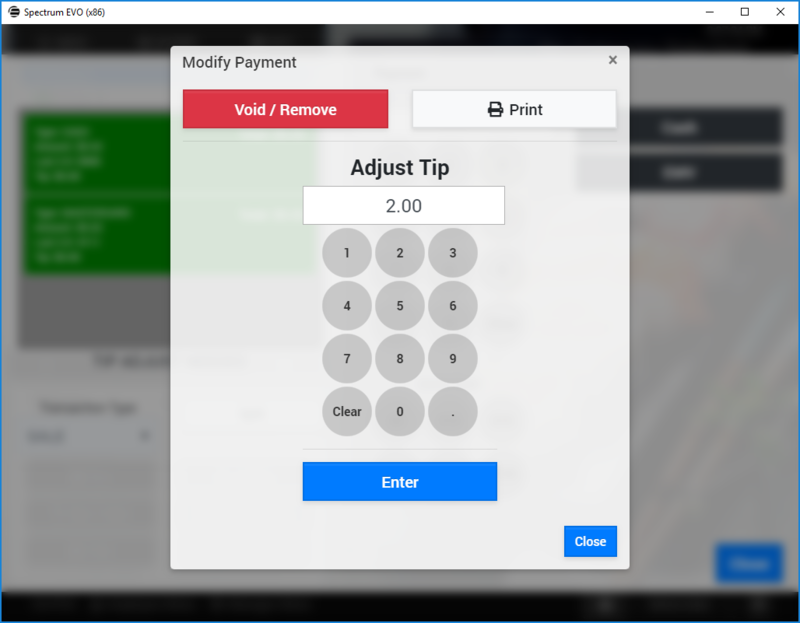 Employees can utilize a simple code or assigned magnetic stripe employee access cards for enhanced security. 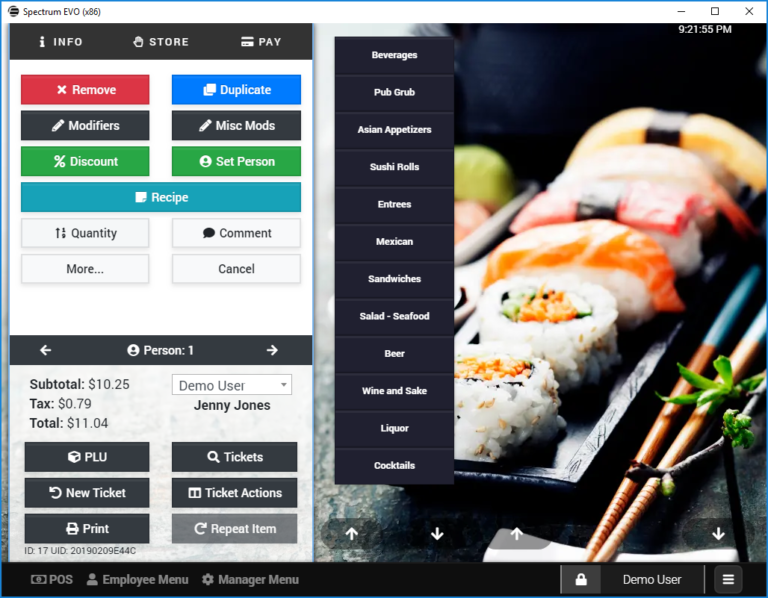 Customizable user pages allow users to view their open tickets at a glance, send and receive messages with other users, view their sales audit and report their cash tips for compliance. Management can easily disable sales reports for “blind auditing”. 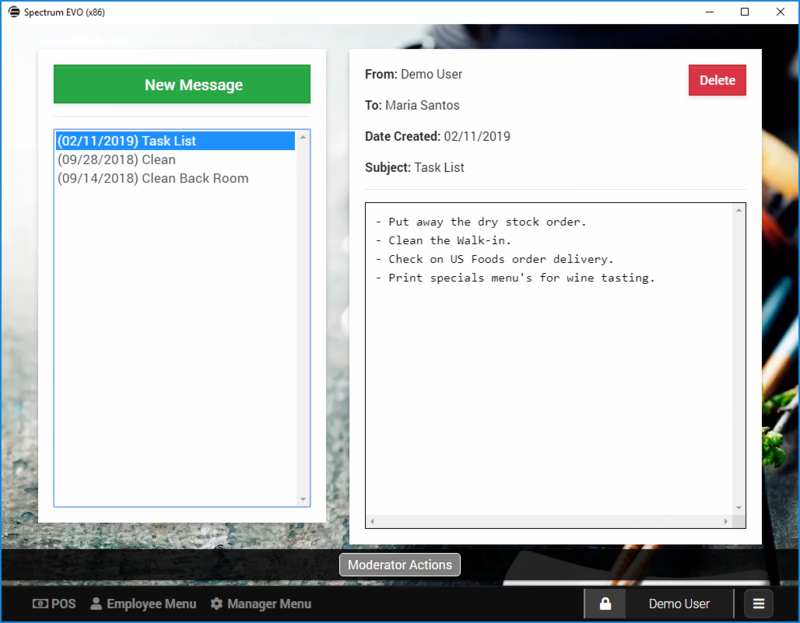 Management can create a message for each day of the week and it will change automatically. 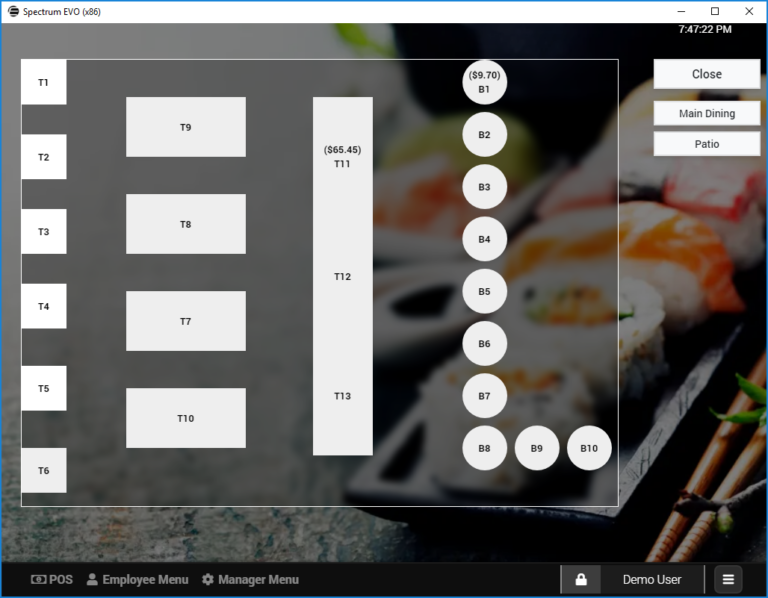 Easy to use, intuitive order entry. 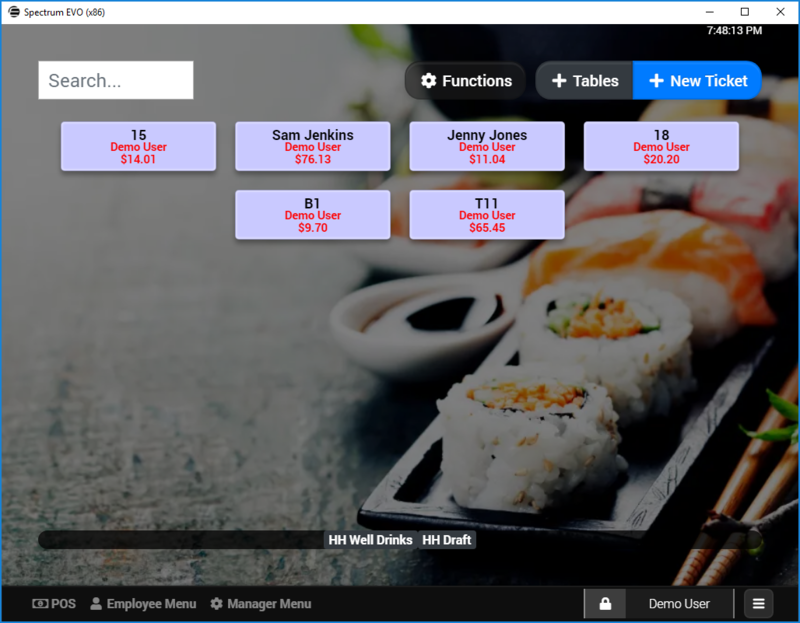 Our tight, focused column layout ensures fast, predictable navigation of the menu. Assign and customize ordered items with a single touch. Assign seat positions, add custom requests, apply item discounts and more. The EVO ticket actions screen allows users to access functions that affect the entire ticket. 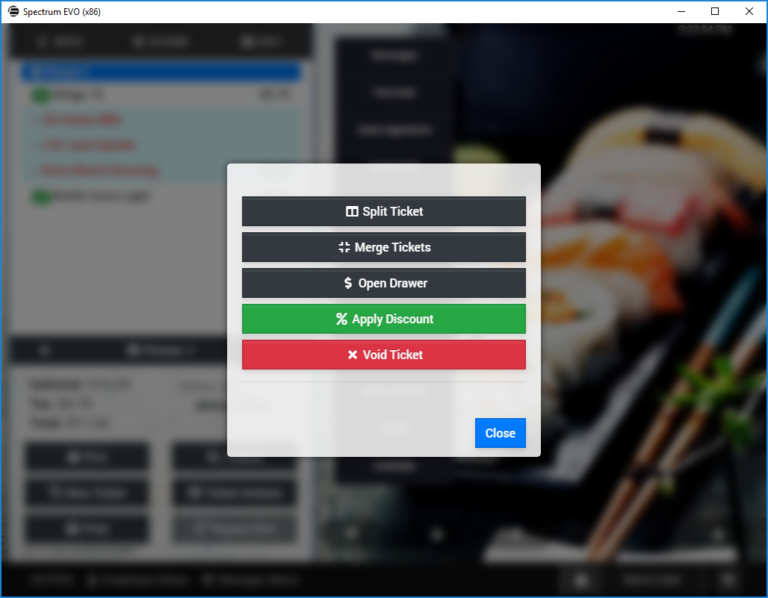 Splitting tickets, combining tickets and applying discounts couldn’t be easier. 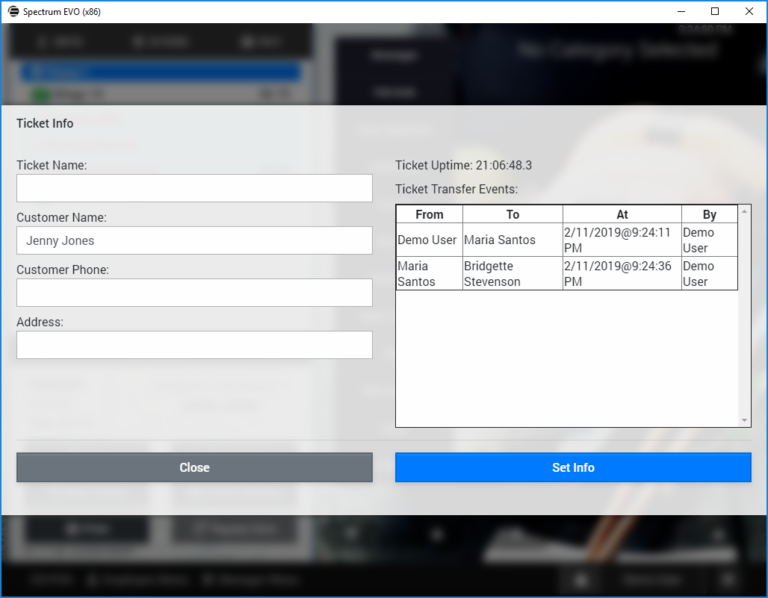 Set custom ticket names and attributes, allowing users to start tabs and tickets, while also capturing valuable customer information for promotions. 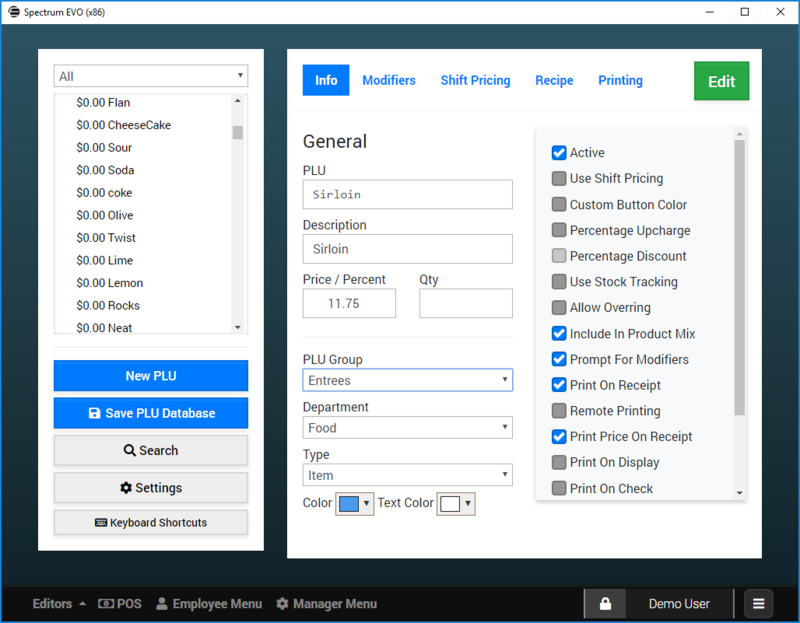 Intelligent item shift levels eliminate extra button presses and keeps categories clean. There’s no need to have 3-4 buttons for each size or type of a given brand. 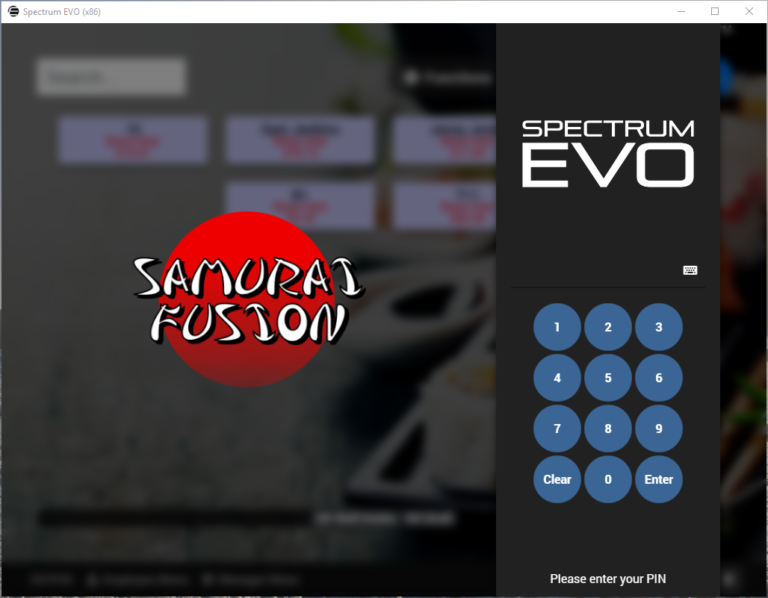 Splitting tickets is a breeze with Spectrum EVO. You can split by item, or by person quickly and efficiently. 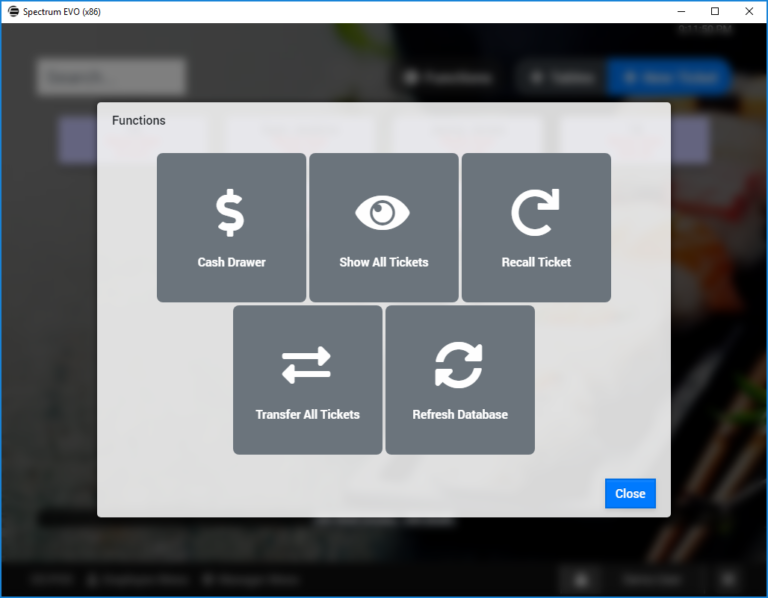 Easily split tickets with multiple payments applied. 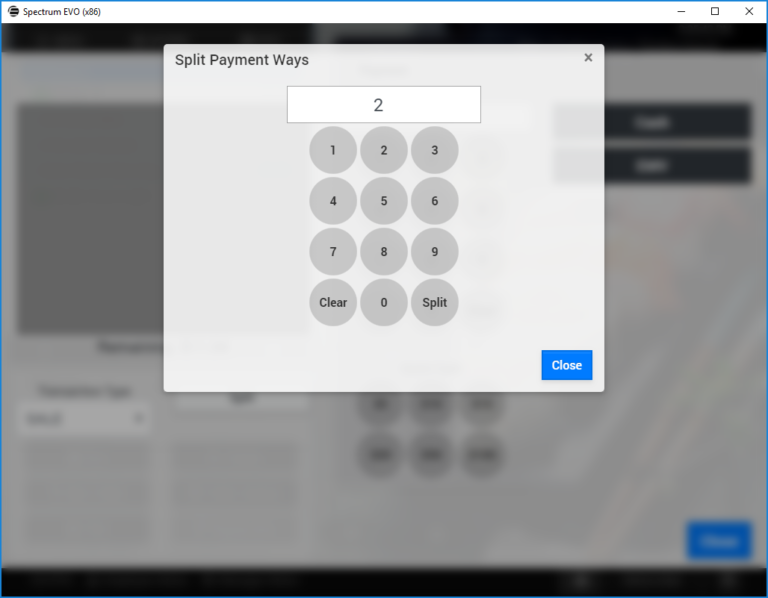 Just select the number of ways you want to split the check and EVO will do the math for you. EVO’s easy to understand tender screen allows users to quickly apply multiple payments, split tenders, process EMV credit card transactions and process returns. Adjusting tips as you go is a breeze. 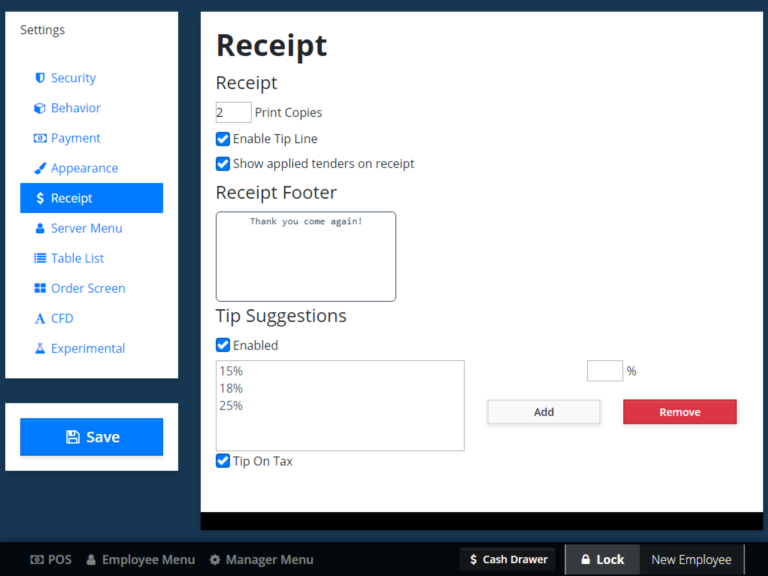 Just tap on the payment in the tender screen an apply the tip immediately if you want, or adjust it later if needed. EVO’s enhanced ticket view is designed to make ticket retrieval as fast and easy as possible. 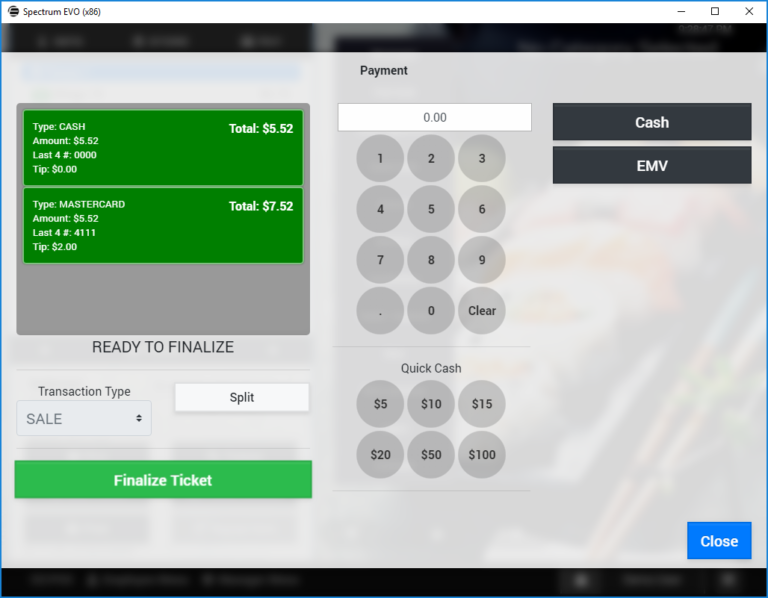 Swipe a customer credit card in this screen to automatically open a bar tab with the customer’s info automatically added to the ticket. It doesn’t get any easier. 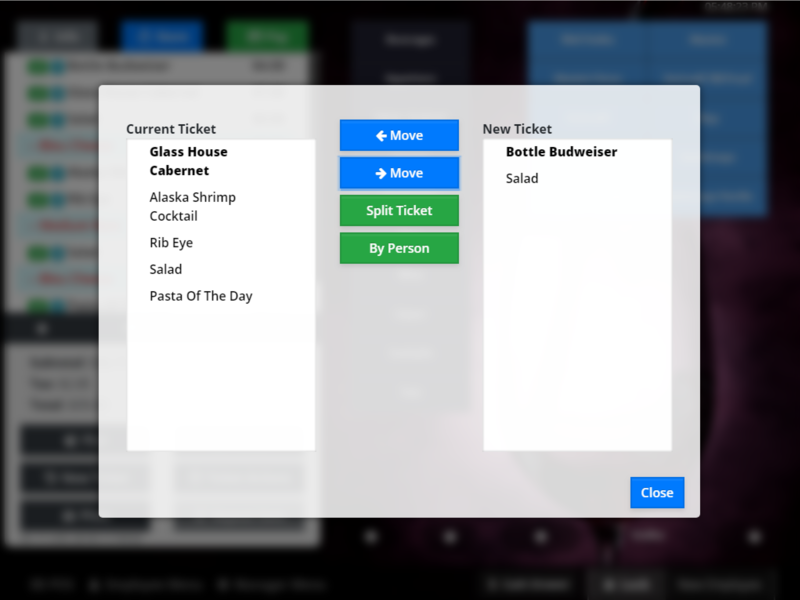 Timed specials are displayed at the bottom of the ticket view whenever they are active. 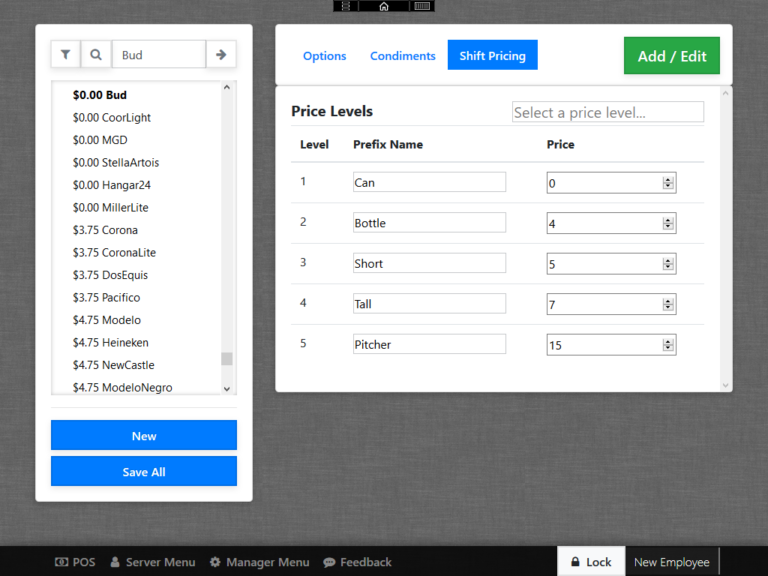 Clicking on the event names will open this window which shows all items that are a part of the special as well as the pricing. 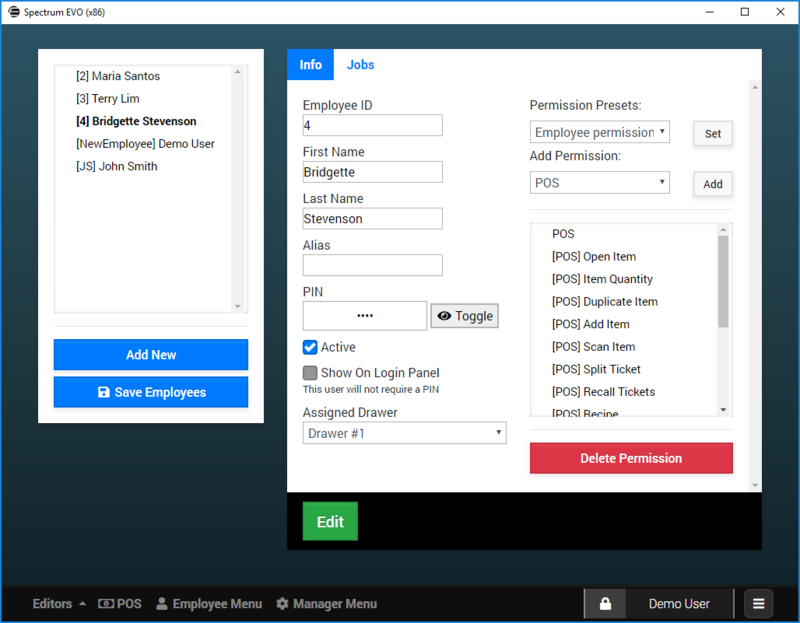 EVO’s ticket functions menu allows quick access to essential functions and is subject to access restriction rules you set up in employee permissions. EVO’s easy to use table layout editor makes designing your table and section screens a breeze. 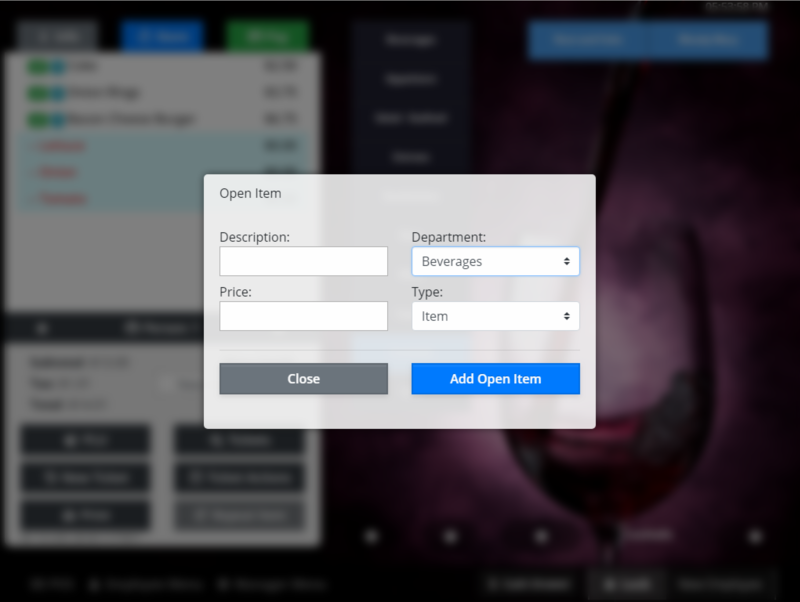 Multiple colors, sizes and image placement options allow for ultimate customizability. 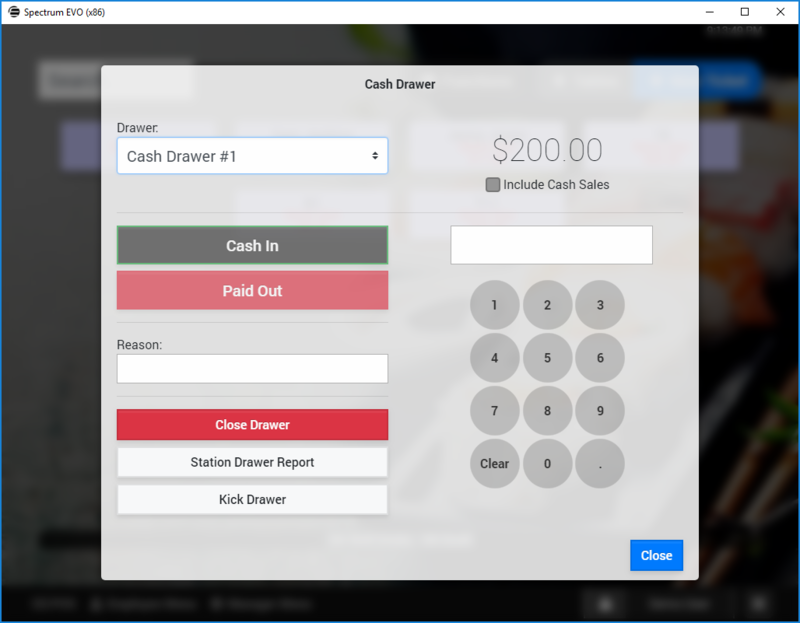 Full-featured cash drawer management that allows for effective management of up to (2) cash drawers per workstations. Track vendor paid outs and misc. 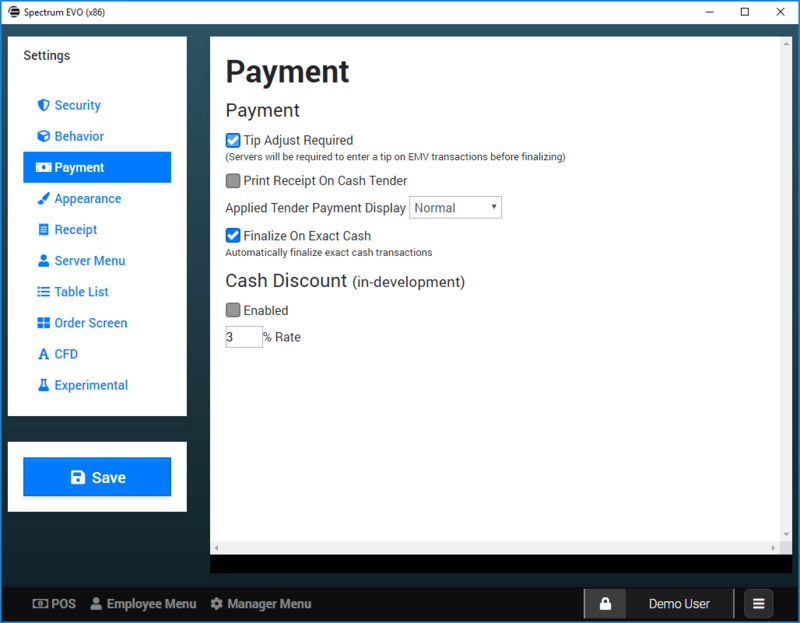 cash-in transactions with ease. Employees can enter cash tips during or after their shift to maintain compliance with local tax authorities. 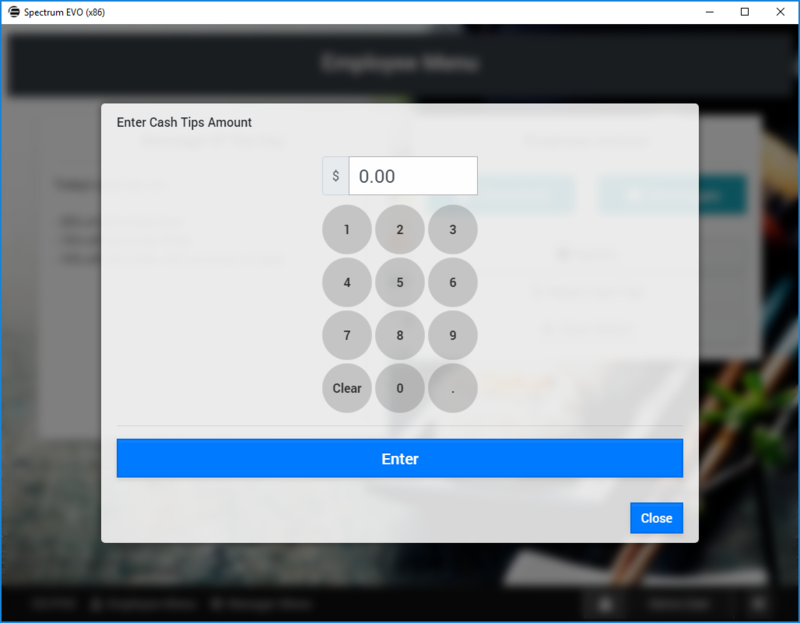 Cash tip entry can be enforced using permissions. 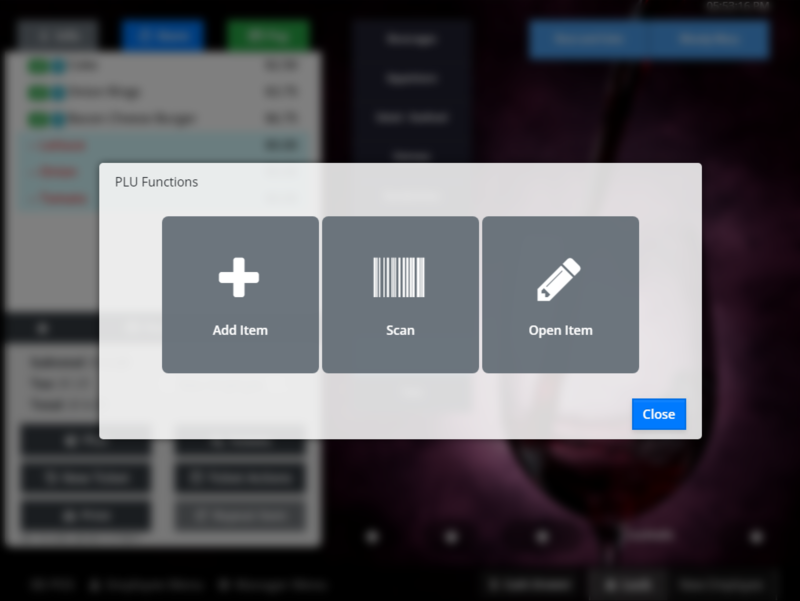 EVO’s PLU menu allows users to add items from the order screen, scan barcodes for item retrieval and even add open-items for items that haven’t been entered into inventory. 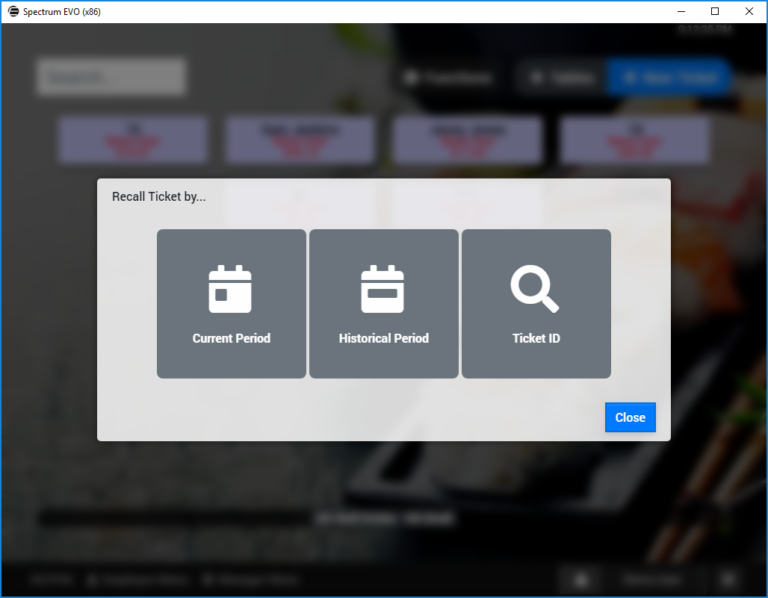 Closed tickets can easily be recalled to reprint a receipt, review order details, clone the ticket, or even reopen the ticket to modify a payment, refund the transaction or void it altogether. Missing an item in your database or didn’t have time to program it in? 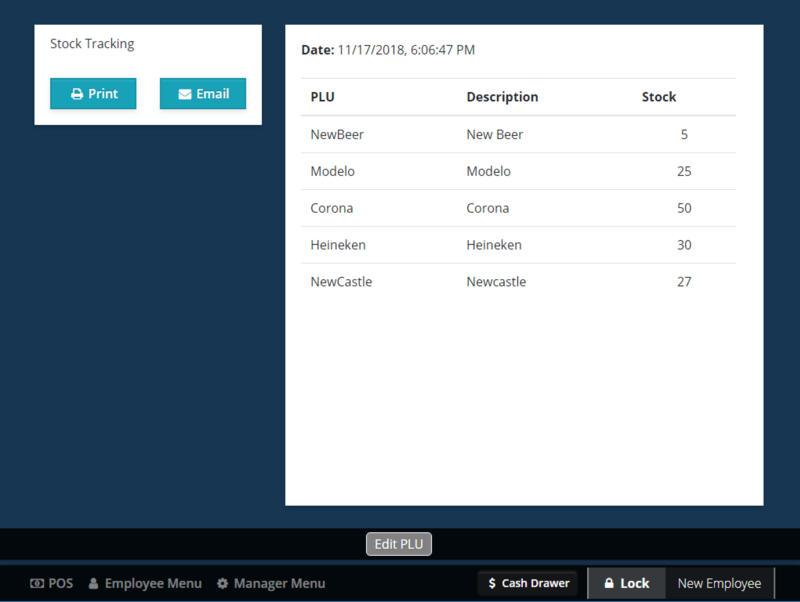 No problem, you can easily add an open-item at any time and even track it by type and department for proper reporting. 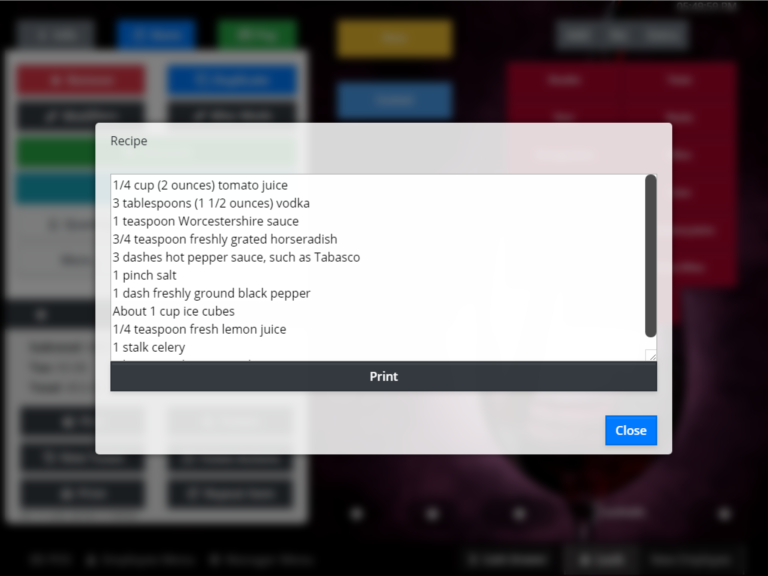 Click on any item entered on a ticket on the order screen and access item recipes, or any other item info you can think of. The uses are endless. 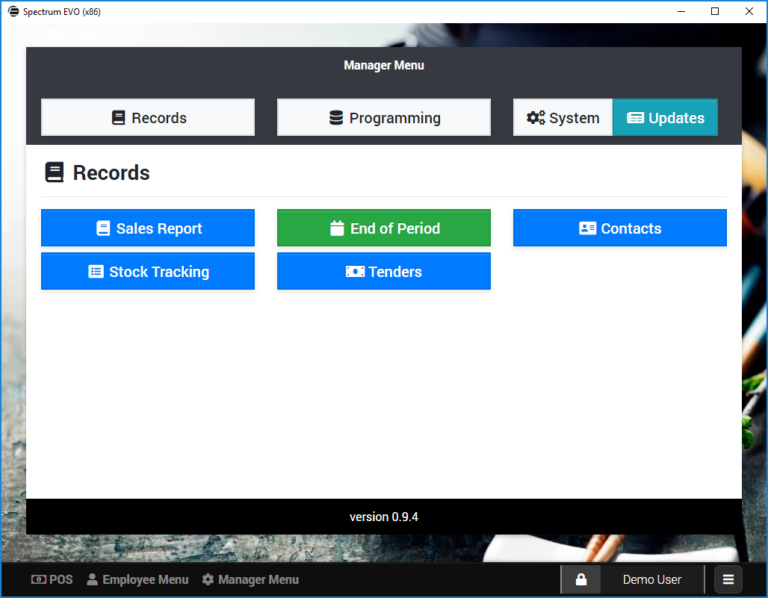 EVO’s records screen allows management to perform frequent tasks in a clean, easy to understand layout. 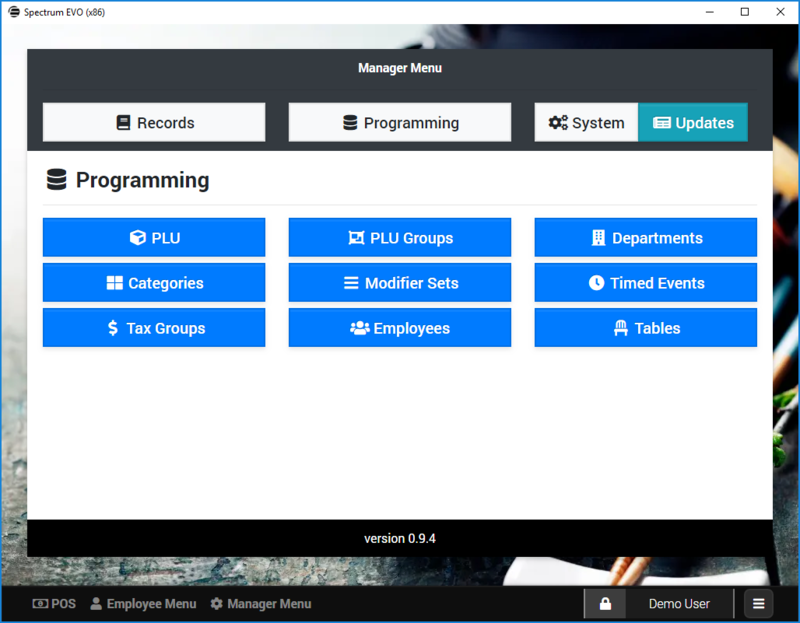 EVO’s programming menu is set up in the flow of the most common programming tasks for easy navigation. The EVO system maintenance menu is perfect for the power user, but easy enough to figure out for the most novice user. Item maintenance is about as simple as it gets. 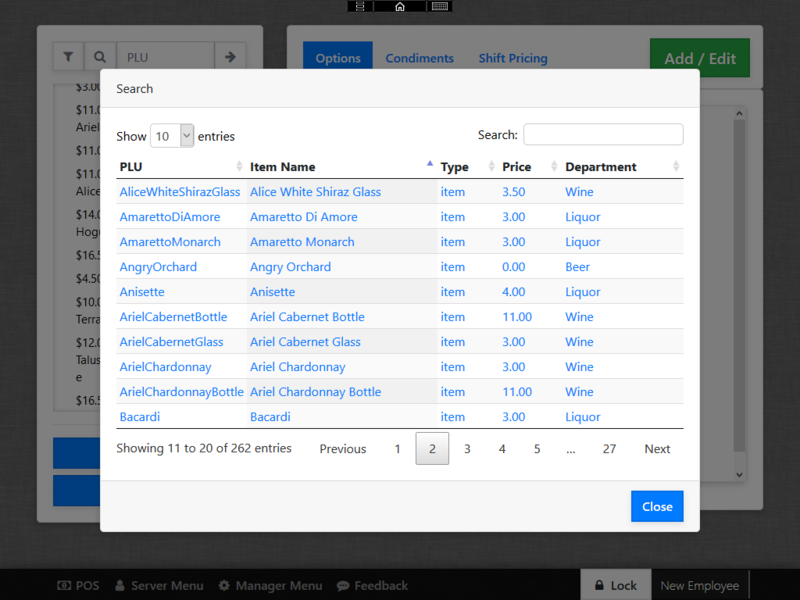 Add a new item, or edit an existing item using our lightning fast lookup feature. 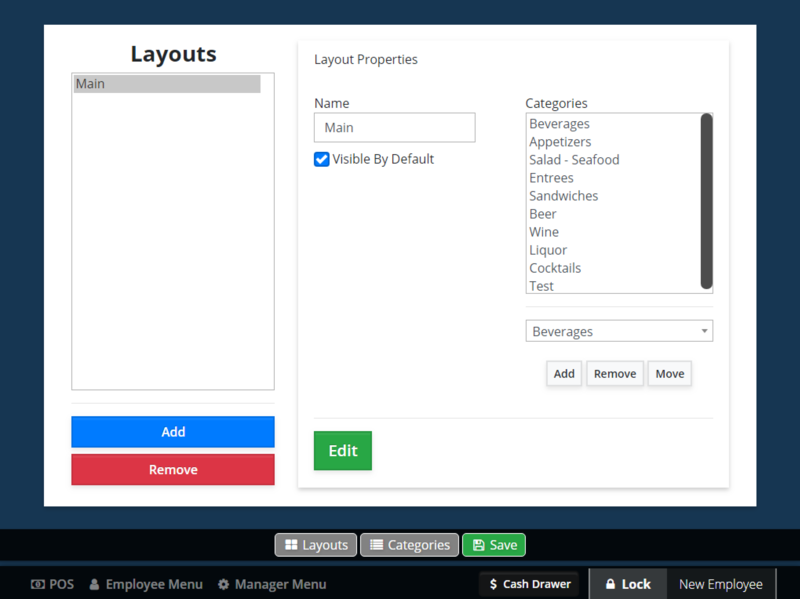 Our fast cloning feature allows users to quickly build large menus with ease. 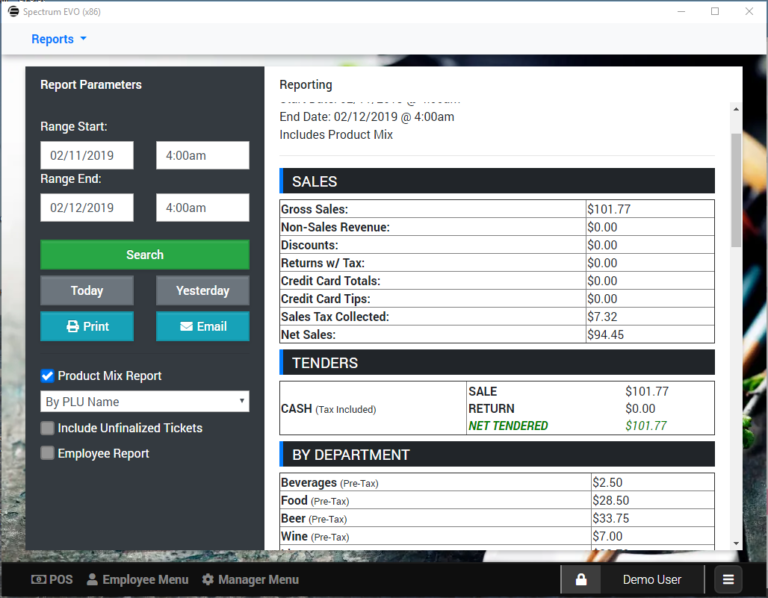 Easy to read and understand reporting with a complete breakdown of key details including tender details, departments sales and more. 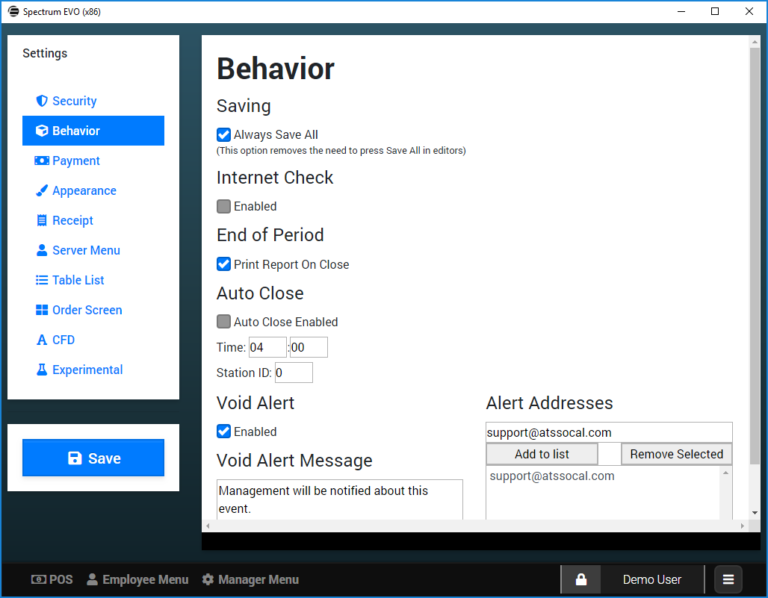 Recall your sales history for the entire business, or by individual user. EVO’s clearly labeled and understandable item editor makes otherwise complex menu edits and changes look like child’s play. 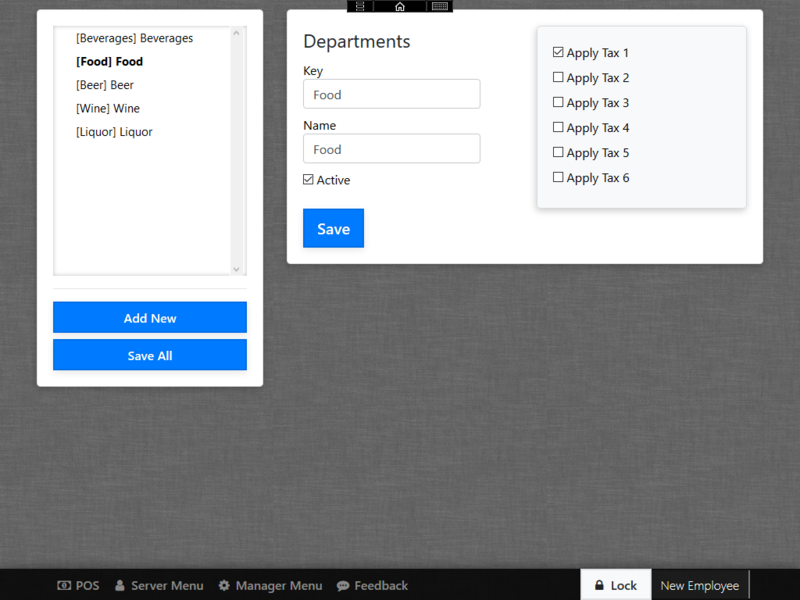 Simple checkbox options allow for full control of item attributes. Adding Modifiers to items is as simple as selecting your sets from a list and attaching them to your item. 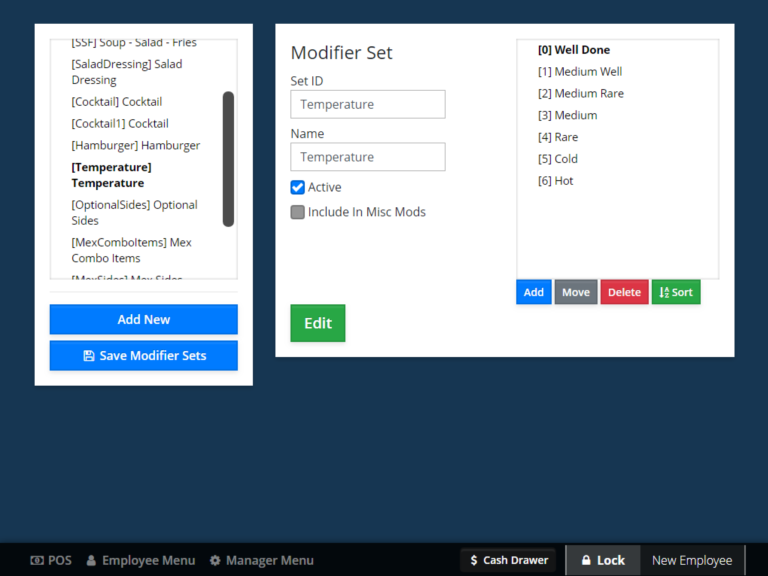 Modifier Sets can be set to display in any order your choose. 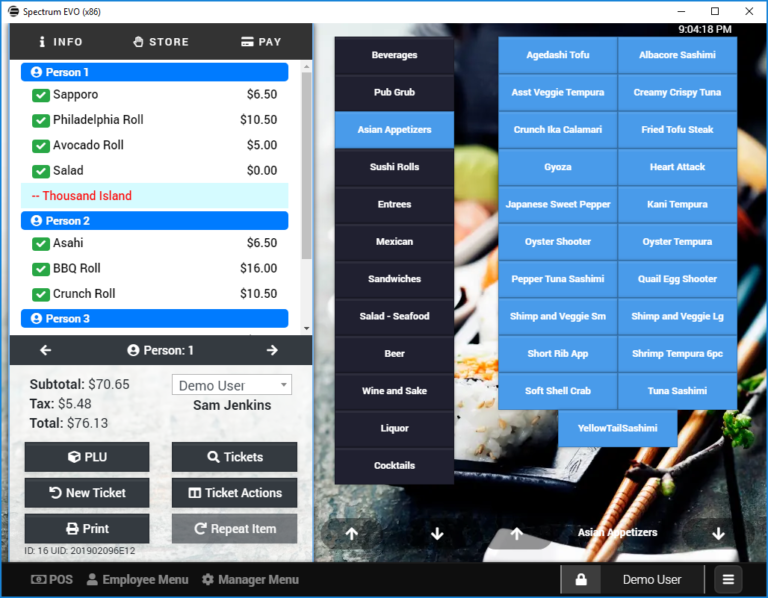 EVO’s Price Shift levels allow users to dramatically reduce “button clutter” and allow for more efficient order entry. Setting up shift levels is a breeze, just name the level, add a price and save it to the item. Editing Modifier Sets (modifiers) doesn’t get any easier than this. 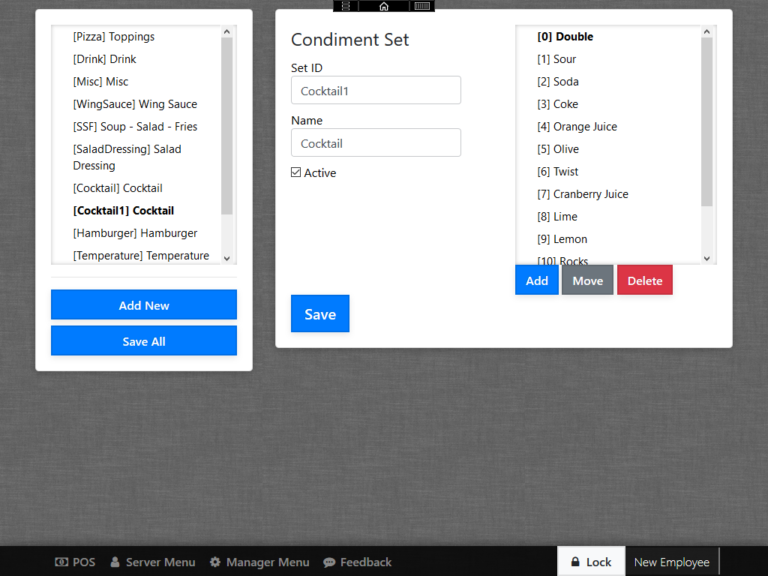 Condiments can be arranged alphabetically or logically, depending on what works best. 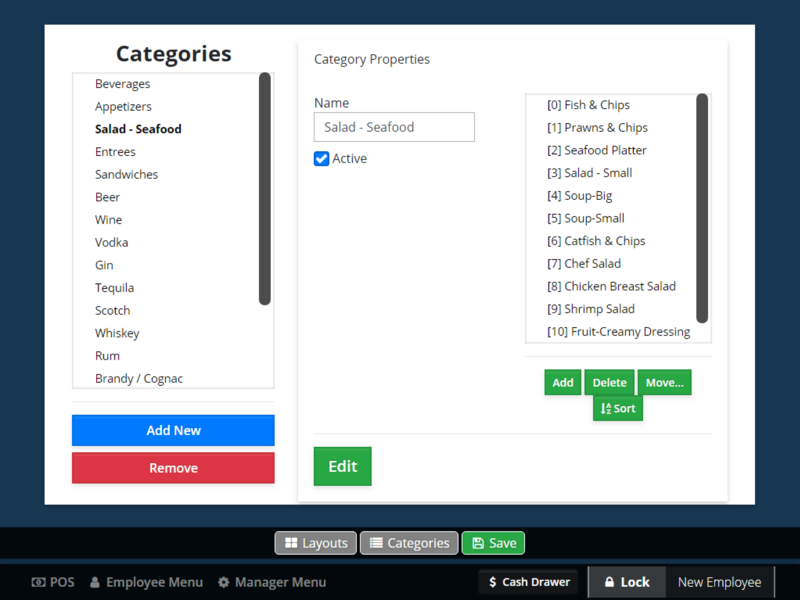 EVO’s category maintenance screen allows for quick creation of screen categories. Categories can be easily arranged depending on user preference. 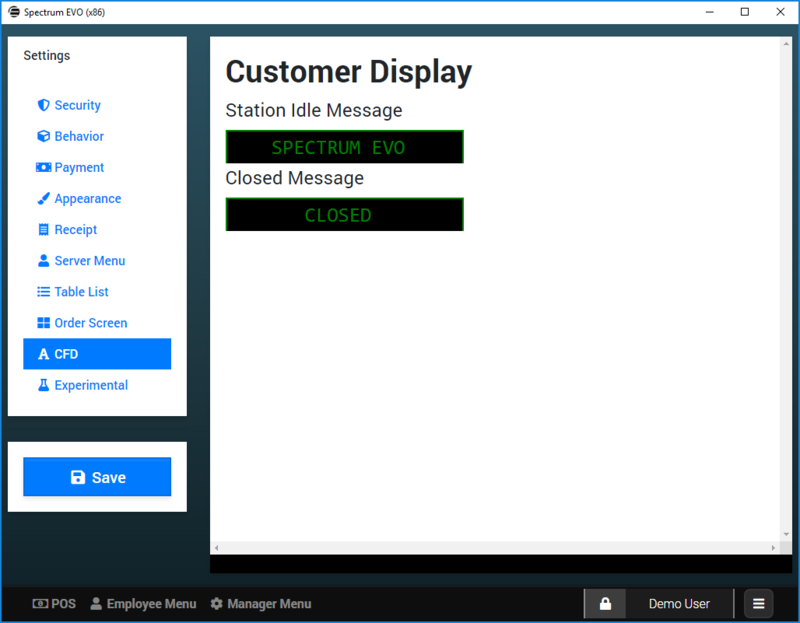 EVO’s category layout feature is an advanced feature that allows users to create category layouts that appear on specific stations, or even appear and disappear, or be replaced based on a pre-set day and time schedule. 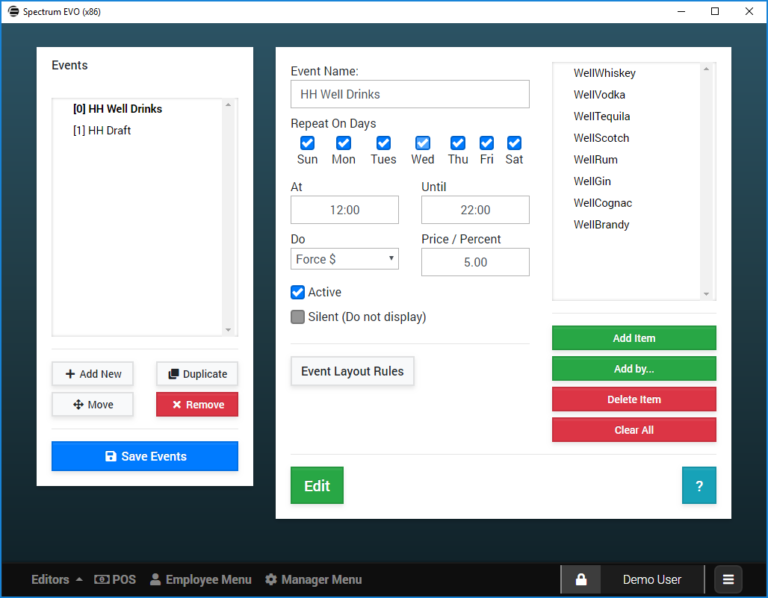 EVO’s department maintenance screen allows users to create the relevant departments that they would like to use for sales reporting purposes. Employee maintenance is highly simplified and easy to understand. Assign user permissions using available permissions templates, or select each permission one-by-one to fine-tune employee access. 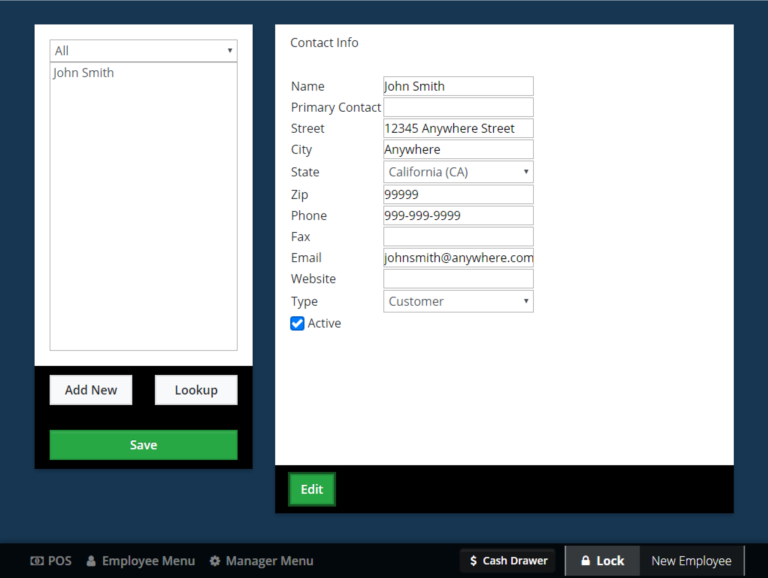 EVO includes a full-featured contact database which allows you to track customers, vendors and manufacturers. 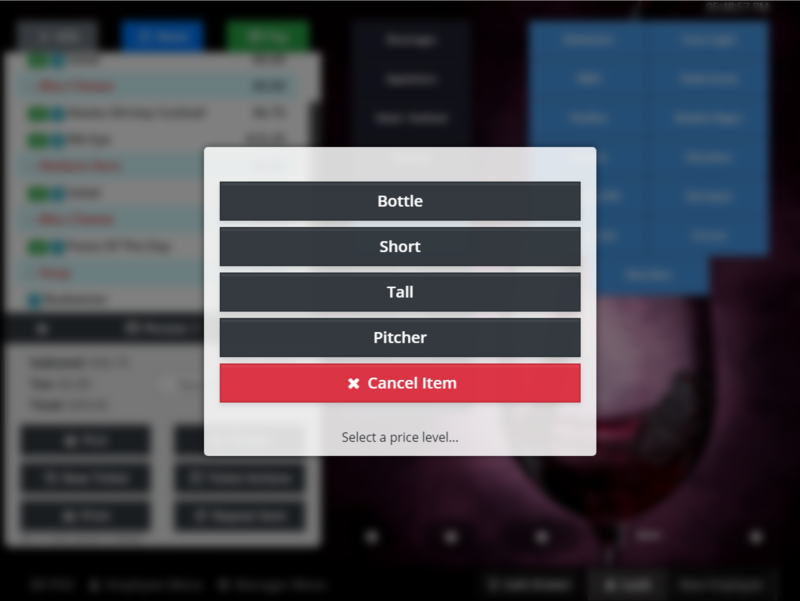 EVO’s built-in stock tracking feature allows you to track current stock levels which deplete as items are sold. 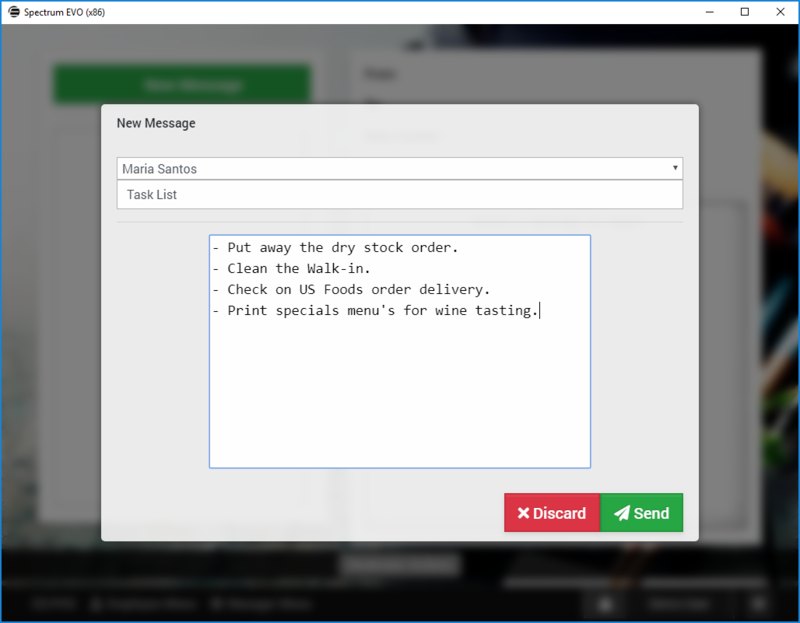 Items that sell to zero can be configured to “86” them from the menu so they can not be ordered if they are out of stock. EVO’s advanced system settings let you configure all aspects of system functionality quickly and easily. Employees can clock-in and clock out for their shift as well as track their unpaid meal periods. Employees can even append notes to their punches in the event they need to punch outside of their scheduled shift. As a manager, time records can be easily edited for final payroll reporting. Timed events are one of the coolest features in EVO. 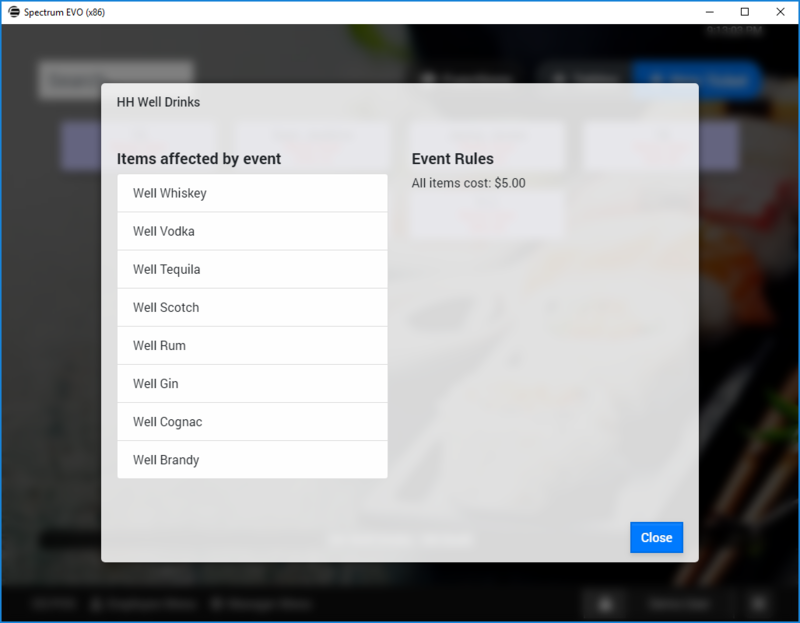 No need to create a bunch of discounts, you can set the rules and forget it. Tuesday is $2.00 tacos, no problem. 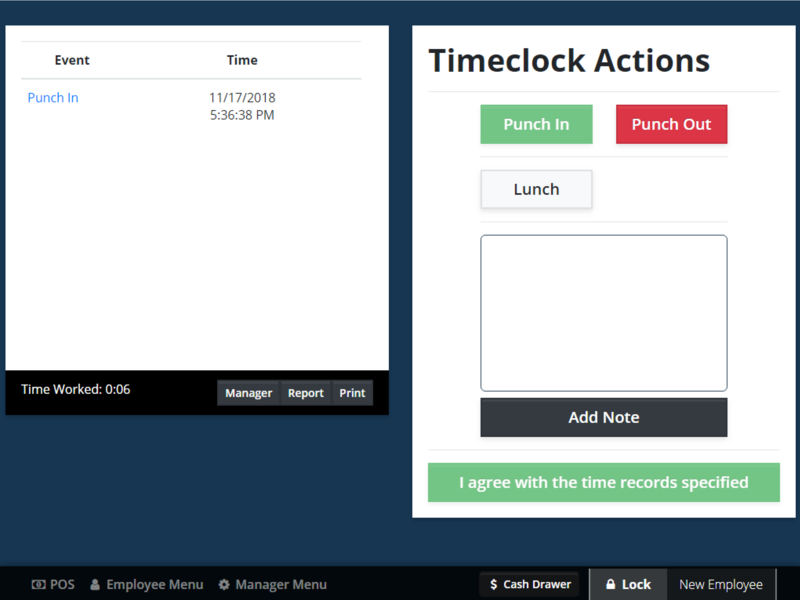 The system will automatically raise and lower the price on schedule. 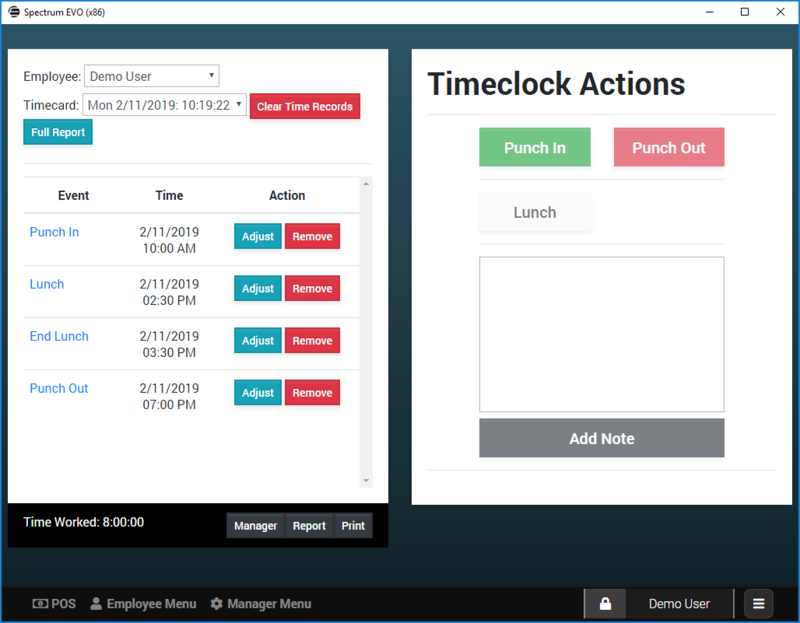 EVO’s internal employee messaging system allows management and users to enhance their communication during and between shifts. 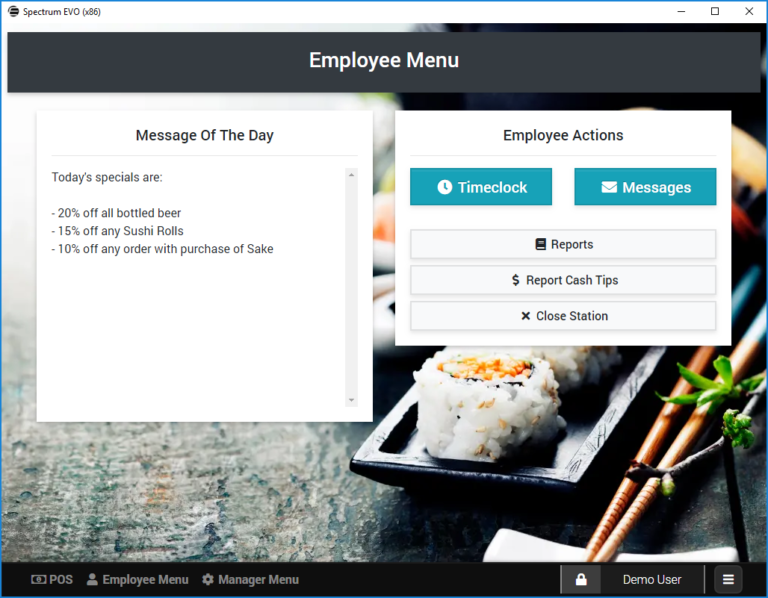 Employees can view, print and manage their inbox from the Employee Menu. 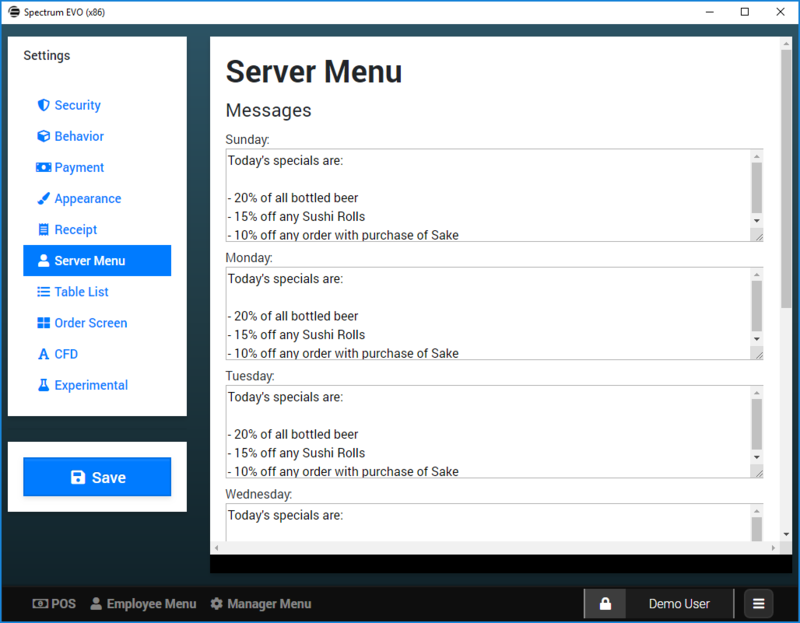 Server menu system settings options. 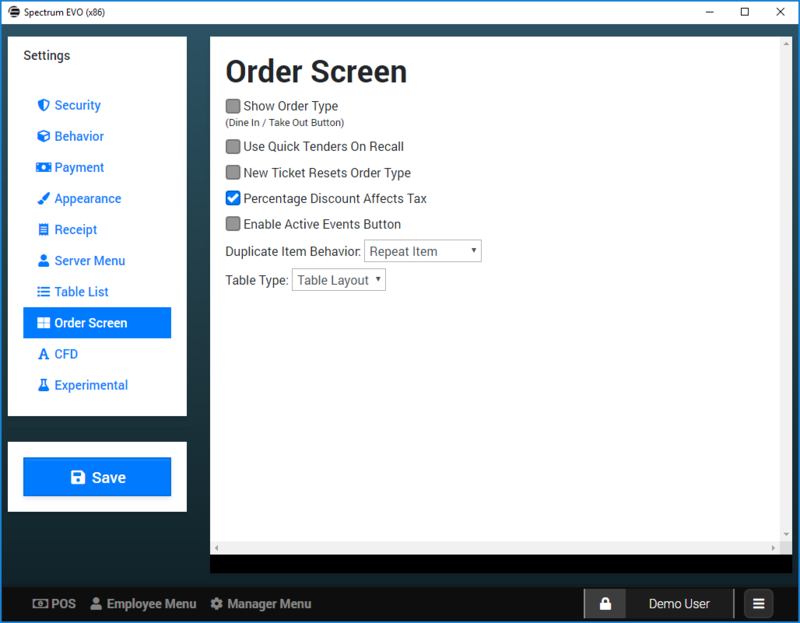 Order screen system settings options. Customer facing display system settings. 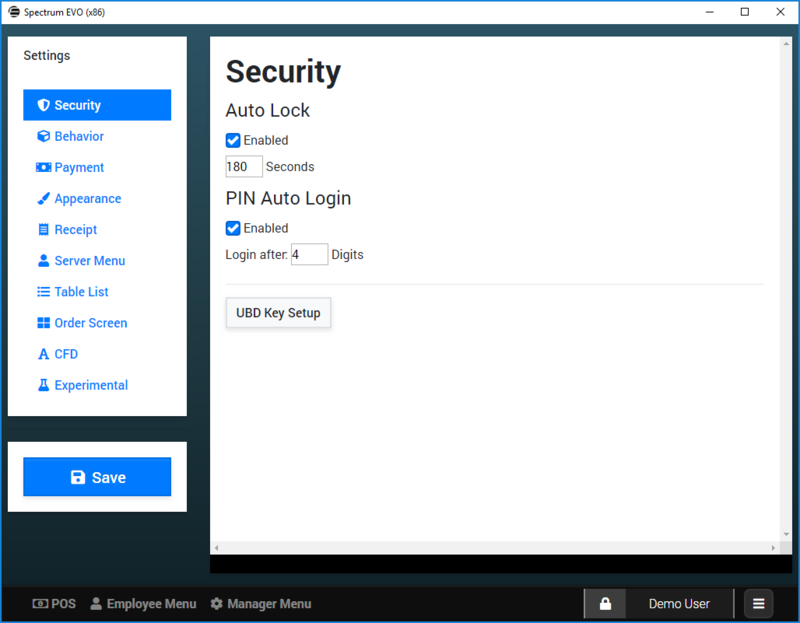 EVO’s UBD two-factor authentication system allows owners to pair their smartphone with the EVO system. The app generates a unique password that changes every minute, ensuring employees can never guess a management code. 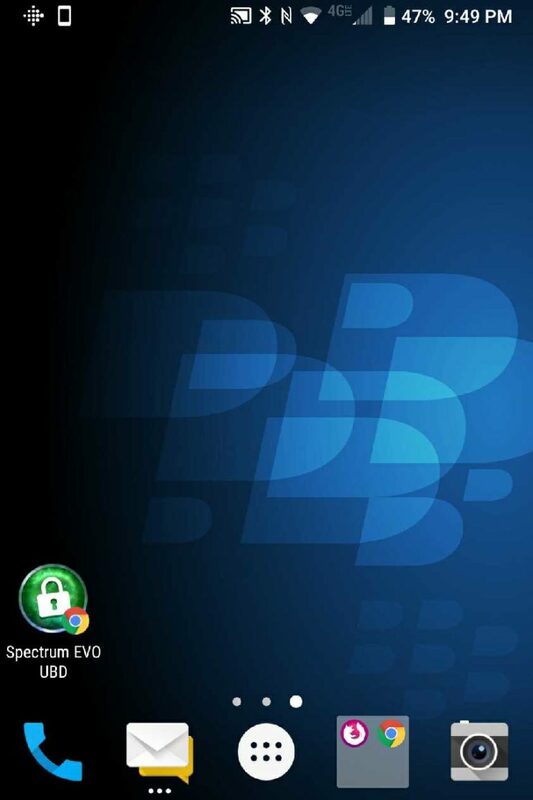 The UBD phone app can be installed on any smartphone OS.